The $3 Primrose looks familiar, but likely isn’t—unless you’ve played one of the free desktop versions. 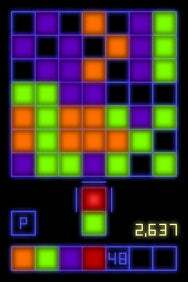 This game offers a unique take on the “tile clearing” genre, and relies more heavily on strategy than a typical puzzle game. Thanks to its innovative gameplay, and an exceptionally clever global high scores interface, Primrose is a fun, challenging, and highly-replayable puzzler. Tile Time: Primrose is a tile-clearing game that relies heavily on strategy. The game starts with a blank 7-by-7 grid. On each turn, you’re presented with a pair of colored tiles to place. You clear tiles by surrounding one or more tiles of a single color with a border of tiles in another color. When you do that, the surrounded tiles disappear, and the surrounding tiles change color to match the cleared ones. With the right placements, of course, chain-reactions are possible which eliminate many more tiles, and score many more points. When you start the game, there are only three tile colors to deal with. As you progress, though, more colors are added, which makes things a bit trickier. Time, though, never becomes an enemy; you’re playing at your own pace, and can consider your next move for as long as you’d like. The game play is challenging enough without a time limit. Primrose saves your high scores to an online board. Amazingly, you’re able to “watch” games on the high score list in their entirety, tile by tile, to see how those impressive scores were achieved—and perhaps learn some strategy, too. Primrose is an addictive game, because you get better the more you play—and the better you are, the more fun the game becomes. Primrose is compatible with any iPhone or iPod touch running the iPhone 2.x software update.